← Hippity-hoppity! It’s a Writer Interview Blog Hop! Severed human heads on poles, bodies used to test infamously-sharp samurai blades, dogs rummaging for a meal in what was left of the human bodies at the execution ground outside Shinagawa in 17th century Japan–in my old neighborhood! When I wrote a few weeks ago that one of my summer goals was to research this time period along the Tokaido Road in Japan, I had no idea that I would discover such startling things about places where I lived and walked and toured. Christians, if any could be found, and smugglers of illegal Chinese or Dutch goods (the only foreign trade allowed at the time), were prime candidates for the gruesome treatment described above. Society was very closely regulated, and systems were designed so neighbor was responsible for neighbor–if one person was guilty, several often ended up dead. It was his description of Shinagawa, however, that really caught my attention to how things have changed in Japan. I only lived in Shinagawa for a year, but my memories include apartment buildings, a green hill with a temple on it, a little flower shop where I bought a 10-inch high evergreen in a pot to decorate for Christmas, a hair salon that presented me with a leather-bound journal for a New Year thank you gift, and a large train station. It was one of the Shinkansen, or bullet train stops, so it was a major station with lots of tracks. When Dr. Kaempfer passed that horrific execution ground, he made his way to an inn “pleasantly situated by the coast.” The coast! Things are so built up in Shinagawa now, that I never even knew it was near a huge body of water until YEARS later when I looked at a map and said, “WHAT? !” Maybe I was being characteristically oblivious at the time, but I never, ever saw any evidence of that when I lived there. Gone is access to the view of “thousands of little boats” that Dr. Kaempfer saw. I hope you’re having an enjoyable summer! Stay tuned for Dr. Kaempfer’s observation on the Dutch merchants he worked for, and the light for Christ that they shed that he called “too dim to spot an elephant.” I guess when there are placards at town entrances forbidding Christianity, and swinging bodies as a reminder that they mean it, it presents a challenging environment for evangelism, to say the least. The stories I’m reading remind me to pray that our country will always hold freedom of religion as a high value. Increasingly, it seems that we are being “told” in society that we are a country based on freedom “from” religion. I’ve seen the result of that stance in Dr. Kaempfer’s work, and believe me, it’s not a pretty sight. Perhaps governments everywhere need to be reminded that three hundred years after the best efforts of the Shogun to eliminate Christianity completely from Japan, Christianity is now allowed there, but the Shogunate is long gone. What has gotten your attention this summer? I’d love to hear about it! 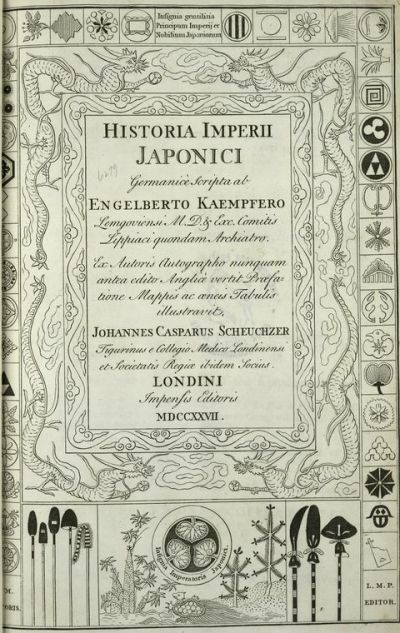 This entry was posted in Faith, Japanese history and tagged Dr. Engelbert Kaempfer, Evangelism, Japan, Nijo Castle, Shogun, Tokaido Road, writing research. Bookmark the permalink. I love history. In all history we see men who did not value human life. This is ongoing. It has been justified many ways. Did the Shinganawa of this period differ from the rest of Japan? It’s only during the 20th and 21st centuries, which we are fortunate to live in, that human value has taken on such importance. I think modern Christianity had the greatest role in bringing that about in western culture. What do you think has caused this enlightenment in Japan? Great article Sonja! Hi Rick! Thanks for reading. I hope you’re having a great summer! Do you miss the MM reunion as much as I have? Thanks for your questions! Shinagawa was like most Japanese towns of the time. From what I understand, most towns had a place for all the signboards indicating the laws that must be obeyed, or what was forbidden, and then the entrances to the towns had the execution grounds. It’s interesting, isn’t it, that the past couple of centuries have valued human life as much as they do. I was surprised to also find out in my research that infanticide of baby girls was a common part of Japanese life at the time, too. Christianity Today had a great article last year about the impact on democracy, education for women, and other human rights that was made by evangelical missionaries over the past couple of centuries. Countries where significant evangelism had taken place were much more democratic and healthier than other countries. After WWII, when western powers set about creating a new government in Japan, things definitely changed. I don’t know for sure, but I think that the execution grounds became a thing of the past with the fall of the Tokugawa regime and the restoration of the imperial family as political power of Japan. Anyone who knows more than me on this is welcome to chime in! I’ve been learning a lot this summer, but I’m sure there are a lot of people out there who know this subject way better than I do. Thanks again for adding to the conversation, Rick!